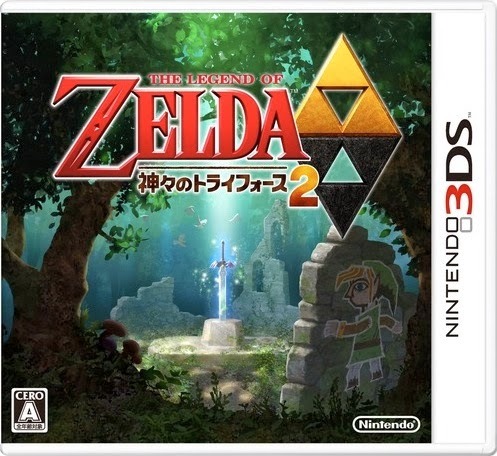 As a result, I'm considering buying the Japanese version of The Legend of Zelda: A Link Between Worlds (Zelda no Densetsu: Kamigami no Triforce 2). At some point. Which could, of course, mean later this week. Why the Japanese version, you ask? Um, I like its box art (which can be seen above)? Also, I'm itching to own a few more 3DS games that hail from the Land of the Rising Sun. In related news: although I've yet to finish the North American version of A Link Between Worlds, already I can say with some assurance that it's one of my five favorite 3DS games--along with Animal Crossing: New Leaf, THE "DENPA" MEN, Mario Kart 7 and Theatrhythm Final Fantasy. Interesting! I still haven't played A Link Between Worlds, myself. I've never really gotten into Zelda games. I definitely think playing the game again in Japanese would be a great way to practice your language skills! Since you know what you're doing already, you don't have to worry about getting lost or stuck, and maybe you'll pick up a few words or phrases along the way! I wish Nintendo would stop making all the Zelda box-art gold in NA. You've never gotten into Zelda games, Anne? That kind of surprises me--although it kind of doesn't, too, as I'm hardly the series' biggest fan myself. I do love the first game and A Link to the Past, though. Have you ever played ALTTP? If not, I'd highly recommend it. And I'd highly recommend this one, too, especially since I know you like the Ys series and this game is *kind of* like some of the Ys games. As for me and my Japanese studies: uh, no, I haven't quite kept them up, I'm sad to say. You and me both, Sam. This art looks so much better in its original form, IMO. Final Fantasy VI is actually my favorite entry in the series, followed by Final Fantasy IV and then VII. I love Link Between Worlds as well..it beat my original Fav Zelda (Story), A Link to the Past. I love Hilda as a character who is all sorts of gray as opposed to some of the more Black/White characters we've seen before (and I hope Zelda in Super Smash Bros. 4 gets a Hilda colour) and..dat Lorule Castle Theme..all 5 Renditions of it..it was that theme that made me find a gamerip OST for my iPhone. Oh, and if you do decide to buy a Japanese Copy, keep in mind that the 3DS is Region Locked, unlike the GBA & DS. I still haven't finished this game, due to powering through some Vita RPGs this month, but I hope to get back to it soon. It's lovely. I also have the digital copy, as I haven't bought any boxed 3DS games since Fire Emblem! I've officially hopped on the digital bandwagon. When I read the headline, I admit - I was given pause. But it does make more sense for you since you are a fan of collecting games and cases and such. I prefer physical over digital any time - but that's as much due to storage space given my ridiculous library than anything else. Hey there, Deva! Ah, another person who loves both ALBW and ALTTP. Of course, how could you not love both games, right? I, too, love Hilda, by the way, and the Lorule Castle Theme. Hell, I love ALL of the music in this game! As for the 3DS being region-locked: yep, I know that. Thankfully, I own a Japanese 3DS, so no worries here in that regard. Yeah, I know, Cody. I can't help myself, though! Good for you for being willing to go all-digital when it comes to the 3DS. I can't do that yet myself. I'm OK with buying eShop-only games that way, of course, and possibly the occasional retail release (full game), but that's about it. Indeed. For some reason it surprises people that my fav isn't Ocarina of Time, which was my first. I actually have to say Majora's Mask is my fav. 3D Zelda though. Speaking of, did you know that there are several references to Majora's Mask in LBW? More in Hero Mode. Aonuma, the director, purposely told the team to put them there and said in an interview that if they wanted to know if a 3DS remake of Majora's Mask was happening, that they should just play Link Between Worlds. Hello again! Oh, I like OOT, too, just not as much as the original and ALTTP (and maybe ALBW). Oddly, I've barely played Majora's Mask--to the point that I really shouldn't even say I've played it at all! It came out at a time when I was transitioning out of gaming (just for a few years), so I pretty much ignored it. My brother bought it and played it, though, and I played a *bit* of it, too, but not enough to really know if I like it or not. So, I'm very much hoping a remake is released for 3DS this year! Did it blow your friggin' socks off like it did mine? Holy hell it was good! Like...so much better than I thought it was going to be that I felt a little ashamed. It's probably my third favorite Zelda right behind LttP and Wind Waker. It has absolutely, positively blown my socks off, Justin. That's why I'm thinking of buying a second copy! I mean, I went into it expecting to be bored (at best) and so far I'm feeling like it's one of the best 3DS games to date as well as the best Zelda game in a looooong while. Also, it makes me want to replay ALTTP--a game I haven't played in yeeeeaaars. Actually, I've never played ALTTP! The only Zelda I've really dabbled in was Link's Awakening DX. Weird, huh? I know everyone LOVES Link Between Worlds, but I think I'm going to wait a bit to play it. I'm sure it's lovely, but I have so many other things I want to get to! Hey, there's nothing wrong with waiting to play ALBW--or not playing it at all. As for whether you should pick this or OOT 3D: hoo, boy, I don't know! It's been a loooooon time since I played the original N64 version of OOT. I really liked it, but I have a feeling I didn't like it as much as I liked ALBW. So, I guess my pick would be to go for ALBW.